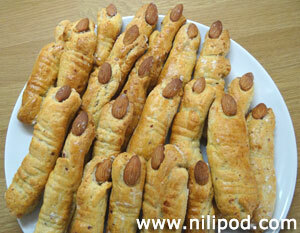 Cheese straws are always really yummy, although for young children, they can be made just that little bit more fun and appealing if they are shaped as fingers - perfect for a healthy Halloween treat. We like making these every year when Halloween comes along, because they look so good and taste so great. 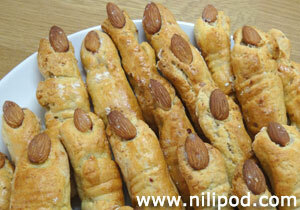 Use a knife to create the lines of knuckles, while the fingernails are made using almonds. They look really effective and just a little bit creepy at the same time, and are the perfect size for even the smallest of lunchbox. You can use either mature Cheddar cheese or parmesan for a strong flavour, it just depends what you have available in your fridge when you are making them. Rub the margarine / butter together with the flour, salt and optional mustard, to create a fine crumb-like mixture. You can either do this part of the recipe with your fingers or by using a food processor. Stir in the grated cheeses, one of the eggs (beaten) and half of the water, until you start to make a firm cheese straw dough. Keep adding the water until you have reached the correct consistency. Place the dough / pastry mix in a plastic bag and leave to rest in the fridge for 30 minutes or so. Now, this is the fun bit. 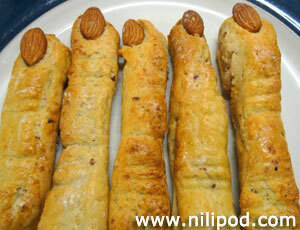 Roll your cheesy dough onto a floured surface and cut into finger shapes. 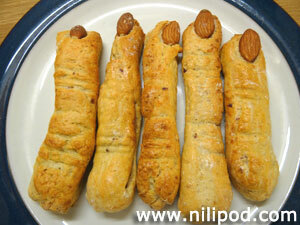 Use a knife to create knuckles on the 'fingers' and use whole almonds to create spooky looking dirty fingernails. Use the rest of the beaten egg as a glaze for your straws and then bake them in the oven (pre-heated to 180°C) for between ten and 15 minutes.